Cid Style File: Weekend Review: The Shoes, The Art & The ER! Doing this post a bit late this Monday night, but I wanted to share my weekend with everyone. I will make it a quick post! I had a busy weekend, although it wasn't really planned that way. It started on Friday with the shoes. I bought these shoes at Payless, had not shopped there in years. I went to Payless to check out the Christian Siriano shoes. I ended finding these wedges, I love them! They are not too crazy, but still have a bit of edge, for me any how. The heel height is perfect and they are very comfortable. I wanted to wear them on Friday with a new dress. When I came out of the room to show my man my outfit, he mad the worst face. You would think he was smelling something very foul! No foul smell, he just hated my shoes and did not hesitate to hide it. Not sure why but he hates wedges, and he hates the gold accents on these shoes. He is sometimes very critical about what I wear and doesn't hold his tongue about it. I got very upset and took off the wedges and threw them at him! I said "fine I'll just burn them since you hate them so much." Very dramatic! Oh boy! That set the tone for the whole weekend, it was gonna be a interesting! I ended up wearing these brown sandals instead from H&M, can you see the disappointed in my face? I did not smile for the rest of the day! 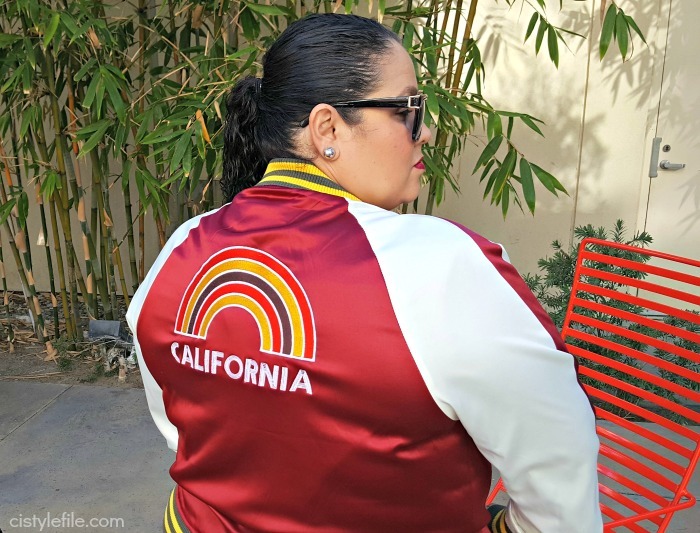 I had done a post early in the week about Torrid's 50% off clearance sale at the Torrid Outlet. 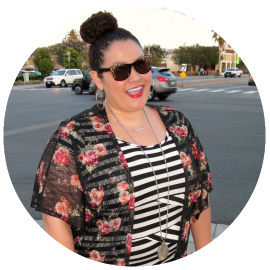 I made a public announcement to all my So Cal, bloggers, and fashionistas to join me at the outlet. Well the response was not what I expected. I forgot it was going to be Easter weekend and lots of people already had plans. I also had plans, that I forgot about. So sadly I didn't make it to the Torrid Outlet! Oh well there is always next time. I will keep you posted. My plans for Saturday were as follows: My BFF had a party for her son and after I was attending an art exhibit. My nephew is a artist and he was going to participate in his first exhibit! Yes I am a very proud aunt and love to share his talent. He is still young and learning, but he has been drawing and painting since he was able to hold a crayon. I have a few pictures to share. The art show was called Jesus his life in art, which was about the influence of religion in art. Several well know from Los Angeles participated along with my nephew. Not his usual subject he paints about but I think he did a great job. Don't mind my face, it was late and I was tired, not drunk! Can you tell curls run in my family, he also got his aunts good looks! 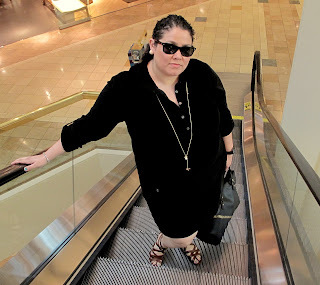 LOL Being this is a fashion blog, (sorry didn't get a full body shot) I was wearing my new boyfriend jeans from Lane Bryant, sequin butterfly top from H&M, with my Old Navy blazer & you can't see them but I wore the above mentioned wedges from payless! Sunday was Easter and traditionally in my family we all get together and have a BBQ. This year was no different, I went over to my parents house to celebrate with my parents, siblings and nieces/nephews. We were all enjoying a delicious carne asada, with beans and rice freshly made by my momma. It was delicious! My 12 year old niece was missing, she was in her room and had not come out for a while. It was a bit odd, since she is also my god daughter and always attacked me when I visited. We called her to come out to eat and she said she was busy. After an hour of being in her room while we were all out enjoying our food. I knew something was up! Sure enough, after it was all said and done we got to the bottom of the drama. She was hiding because she had pierced her lip! She had tried to do it a few weeks ago and we caught her and she was told she is not allowed at 12 to have a piercing other than her ears. Well the smarty pants wanted to "see if her hole had not closed". She had bought another lip ring and put it on. After all the arguing and yelling for her to remove it, we found out it was stuck. I am not familiar with lip piercings but I guess once you put it on it's not as easy to remove. More than she disobeyed her mother and pierced her lip, we were worried about infections. A do it yourself piercing at home by a 12 yr old does not seem to be the best or safest way to have it done. So off we went to ER, to make this post short after I promised a short post. It was removed by the doctor in the ER, she recieved a tetnus shot and antibiotics. After this busy weekend, I feel drained, physically and emotionally. Sometimes I just want to stay home and veg out with my snuggie. I love to see and spend time with my family and friends, but sometimes I need a break from them as well. I hope you all a great weekend with no drama. I love the blazer on you and I aw I wish we could see the shoes on you, they look cute. Also OMG carne asada. It's been so long since I had some. aww my boyfriend is the same way! when he doesn't like it he's not gonna put a smile on his face and jus tell me i look fine... lolz i hate his "i hate that" stink face... sometimes i'll do wut u do and get pissed cuz he hates sumthing i love or just wear it and hope it grows on him! lolz... ur niece is so funny... she's not even a teenager yet so i can't say "darn those crazy teenagers"... but darn these crazy kids! it seems so long since i was 14 and got my tongue pierced against everyones will lolz... hopefully she's okay both healthwise and with not being able to have that piercing... and yeah family is great... sometimes only in small doses tho ;) glad u had a not too bad Easter girl! Only a man who has never been in agony in a spiked heel would hate a wedge. Ignore him those are cute! PS. I LOVE THESE WEDGES! love this lady! and i wish i had ure familys amazing curls ... xoxo! Wedges are hot!! What's the problem?? Men are so duh! sometimes. Lol.